With over fifty countries to choose from and a variety of experiences to be had, Africa is a wonderful place to visit. Interestingly, the numerous holiday options on the continent make choosing your starting point seems a difficult task. Truly, the best of Africa can be found in many places, but some are more magnificent than others. To help you take the first step into exploring Africa, we’ve created a list of the top 5 places you should visit at least once in your lifetime. Located in the southeast of Africa, Malawi is the destination that will spice up and beautify your trip in no time. When there, make sure to visit the small but marvellous wildlife parks – Majete and Liwonde. Majete grew from a deserted forest into the premium wildlife destination within the past decade, with over 2,500 animals being reintroduced to what people now call ‘the Big Five reserve’. By the year 2017, the population of animals that reside here grew to over four hundred, leading to translocation of 200 of these elephants to Nkhotakota to repopulate it (500 Elephants initiative). At Liwonde, make sure to take a boat safari to fully enjoy the tropical experience. You should also hop 0n to Nyika, the wildlife park in the north, where you will find many bird and antelope species and some gorgeous zebras. Malawi is a promising country, basically untouched by Western tourism. However, it has the biggest potential of all thanks to its amazing culture and beautiful landscapes. The third largest African lake is located right here, making it possible for visitors to go snorkelling and see cichlids that basically live in this one location in the world! Morocco is beautiful and vibrant, and the home of unique cities that will amaze you with the Moroccan charm. If you decide to visit the Red City of Marrakesh, you will either be amazed or appalled by the chaos, but what will surely happen is you will fall in love with the medina, fresh orange and bright stalls. Going toward the west coast, you can find the city of Essaouira, popular as one of the filming locations of Game of Thrones. This city has plenty to offer. Starting from the old walls that surround it to the crowded fish markets located in the harbour – there is something for everyone here. If you are more of an adventurous type, the windy weather will provide you with a unique opportunity for some fun watersports. Barack Obama in Cape Coast Castle, Ghana. Ghana might not be the first thing that pops into your mind when you hear of Africa, but it definitely should be. Combining wildlife, rainforest, bustling markets and beautiful beaches, Ghana is truly the place to be! Solo travellers especially enjoy this location because it is not just adventurous, but also very safe compared to some countries you can find in the west of Africa. English is the most commonly used language in Ghana, which is another big plus for a tourist. If you strive for adventure and don’t mind chaos, you will love this friendly and colourful destination. Not only do the scenery and architecture differ, but so does the landscape – and drastically. As you move along, you will see a rapid change from savanna to rainforest. If you decide to visit Ghana, don’t miss out on Mole National Park – it is located on a high cliff and is popular for the elephants you can get personal with, as well as monkeys you will probably watch from a distance. 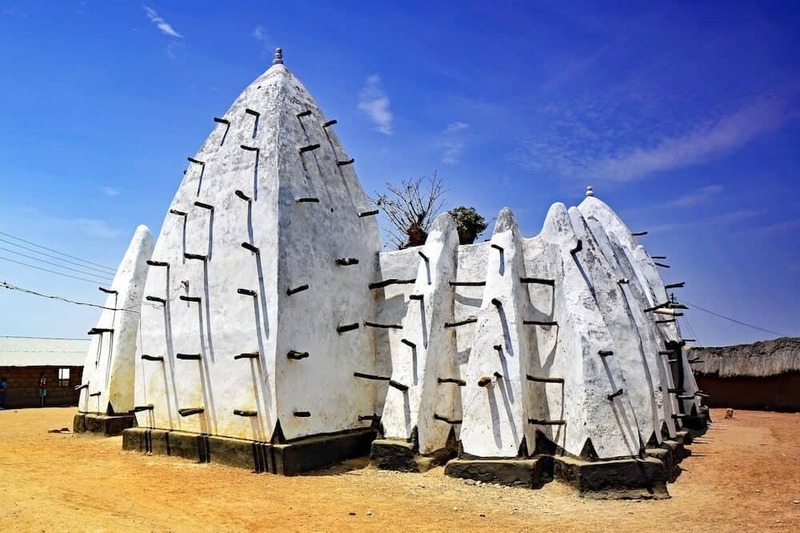 The Larabanga village is the home of the oldest mosque in the area, while the Cape Coast has an exquisite castle and a rich African slavery history. Zimbabwe shares borders with Botswana and Zambia, and offers opportunities that you should not miss on your travel. Visit the Victoria Falls town and you will surely find the activities around Mosi-oa-Tunya: ‘the smoke that thunders’ (the local name for Victoria Falls) to be unforgettable, such as whitewater rafting, bungee jumping, river cruises, etc. The most popular national parks here are Matobo, Hwange, and Lake Kariba. Looking for the greatest beaches in Africa? If this is your choice, then Seychelles should come at the top of your list. The stunning archipelago called Seychelles is located right in the middle of the Indian Ocean, but a bit further from the mainland of Africa. Some think that this is a luxurious spot where only the rich visit because of its location, but this isn’t true. There are also many affordable guesthouses and finely priced local food you can enjoy on a budget, while the transportation is not expensive either. With their jungle treks and waterfalls, as well as gorgeous bays and crystal clear water, there’s no better place to spend your vacation days in. Have you made a choice among the top 5 places in Africa above? Sincerely, all these places should be on your Africa bucket list, but where will you start? To make your next trip a unique experience, speak with Afro Tourism on +234-903-000-1895 or [email protected] You can also search for a rock-bottom price travel deals here. About the author: Olivia is an incurable optimist who always sees the glass as half-full. She likes nature, knows how to enjoy silence and is keen on writing for various websites as well as for Assignment Aussie Writings Service. Meet her on Twitter.